The Tampa Bay Rays return home Thursday following a 3-0 loss to the Orioles, and an abysmal 3-5 road trip. 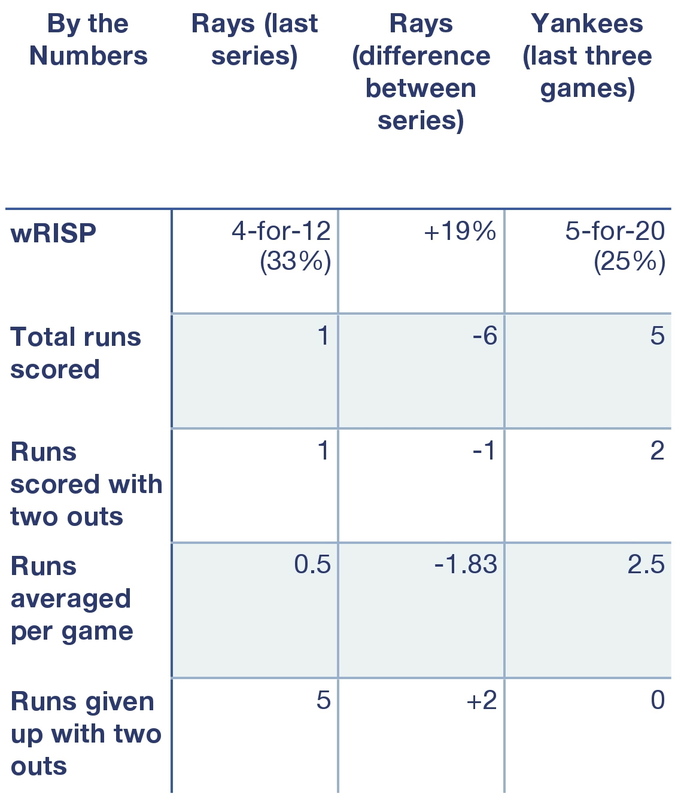 Suffice it to say, after going a combined 11-for-52 wRISP (21%), the Rays bats may have been in the dugout, but they certainly weren’t in the batters box. Tampa Bay has now dropped three in a row, while averaging under two runs per game over a ten-game span. Look at the bright side: The Rays are 7-8 after the first 15 games. Compare that to last season when Tampa Bay went 5-10 in the first two weeks of the season. The Rays welcome the Yankees to the big top for a four game set. At 6-16 (against the Yankees) in their past 22 games at the Trop, the Rays will try to turn their misfortune around. The Yankees haven’t won a season series against Tampa Bay since 2009. Much like the Rays, the Yankees are banged up. 1B Mark Teixeira, closer Dave Robertson and backup INF Brendan Ryan and C Francisco Cervelli have all been on the DL since opening day. SS Derek Jeter has missed a couple of games with quad issues, though was expected to return to the fold Wednesday night. Yet, the Yankees are atop the AL East with a 9-6 record, having won four in a row. It bears mentioning, with a 5 IP/3 ER/3 BB/4 K slash line on 95 pitches (59 strikes, 62% K/BB), Jake Odorizzi put together a decent start Wednesday. Odorizzi kept the Rays in the game throughout his stint on the mound. In short, it is akin to what we should hope for (or expect, somewhat similar) out of Erik Bedard and Cesar Ramos, Friday and Sunday. It is essential for the bats to come to life — after all, three of their last six losses came by three runs or fewer. And if you accept the idea that a four run chasm is not an unbridgeable gap, the Rays could have won four of their last six games. 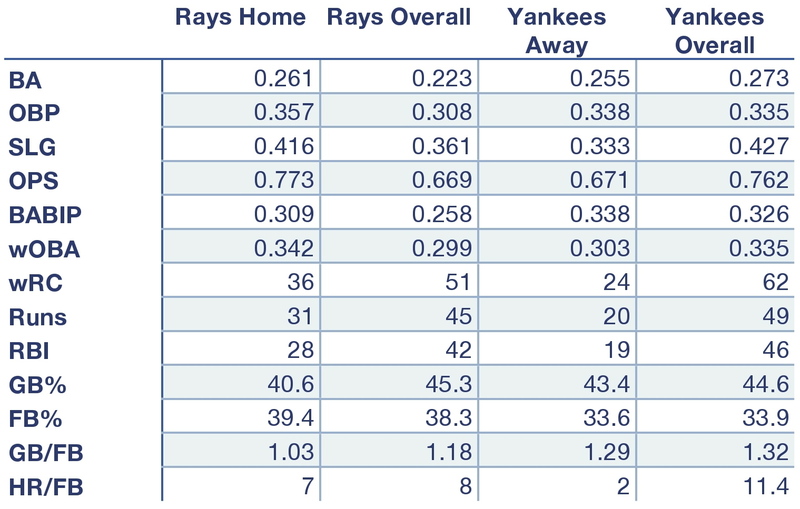 Rays and Yankees offensive production at home, away, and overall. Rays and Yankees, by the numbers. CC Sabathia: The Rays LOVE CC Sabathia. Thursday marks the 10th time Price has opposed Sabathia, and Tampa Bay won eight of those matchups with Price going 6-1 with a 2.68 ERA. Sabathia is 1-6 with a 6.11 ERA in his last eight starts against the Rays, and 0-5 with a 4.50 ERA in his past eight at Tropicana Field. Meanwhile, his velocity continues to plummet. Case in point, his first start of the season (against the Astros) when Sabathia’s fastball averaged 90.6 MPH, peaking at 91.6. The continued slowing of his radar gun readings has gone from “concerning” to “alarming,” while his ERA/FIP/xFIP/SIERA are all on a three-year rise. In short, facing the swarthy LHP could be just what the Rays need to jumpstart their offense. Key match-ups: David DeJesus (16-57, 7 2B, HR, 6 RBI), Yunel Escobar (11-36, 4 2B, 2 HR, 10 RBI, 3 BB), Ryan Hanigan (3-9, HR, RBI), James Loney (5-18, HR, 3 RBI), Evan Longoria (21-53, 6 2B, 6 HR, 13 RBI, 12 BB), Wil Myers (3-9, HR, 5 RBI), Sean Rodriguez (13-42, 3 2B, 3B, 2 HR, 6 RBI, 4 BB). Hiroki Kuroda: Per Rotowire, “Kuroda gave up four runs on six hits and three walks, while striking out five over 6.1 innings, in Saturday’s 7-4 win over the Red Sox.” Kuroda could be another godsend for the Rays. At 2-3 with a 7.36 ERA against the Rays over the last few years, Tampa Bay has had their way against the 39 year old RHP, tagging him for 26 runs (24 earned) in 29-1/3 innings of work. Overall, the Rays have slashed .268 BA/.321 OBP/.546 SLG/.867 OPS against Kuroda, with eight players posting a +.250 OBA. Key match-ups: David DeJesus (2-6, 2 2B, RBI), Yunel Escobar (4-16, 2B, BB), Logan Forsythe (1-3, BB), Desmond Jennings (3-11, RBI, BB), Matt Joyce (5-14, 3 HR, 3 RBI, BB), Evan Longoria (4-14, 2B, HR, 13 RBI, 5 BB), Wil Myers (1-2, BB), Ben Zobrist (5-12, 2 2B, 3B, 2 HR, 4 RBI, 3 BB). Ivan Nova: Out of the starters listed for the series, Ivan Nova has been the toughest nut to crack for Tampa bay. The Rays, historically, have not fared well against the 27 year-old RHP. If his last outing speaks to anything, it’s how tough he can be on opposing batters. Nova bounced back from two bad outings to begin the season Sunday night, holding the Red Sox to two runs on eight hits over 7.1 innings. His velocity is down, as is his K/9. Still, if Sunday’s outing speaks to anything, it’s that Saturday could be a long day for the offensively strapped Rays. Key match-ups: David DeJesus (3-7), Desmond Jennings (6-22, 2B, 3B), James Loney 6-10, 3 BB), Evan Longoria (8-28, 2 HR,, 5 RBI, 2 BB), Wil Myers 3-12, 2B, BB), Sean Rodriguez (2-5, HR, RBI, 5 BB). Sabathia has been susceptible to the big inning and the long ball so far in 2014. He has yet to record a quality start in three outings and has surrendered five home runs. With Wednesday’s 3-0 loss at Baltimore, the Rays have been outscored 37-14 and hit .191 while losing six of nine. 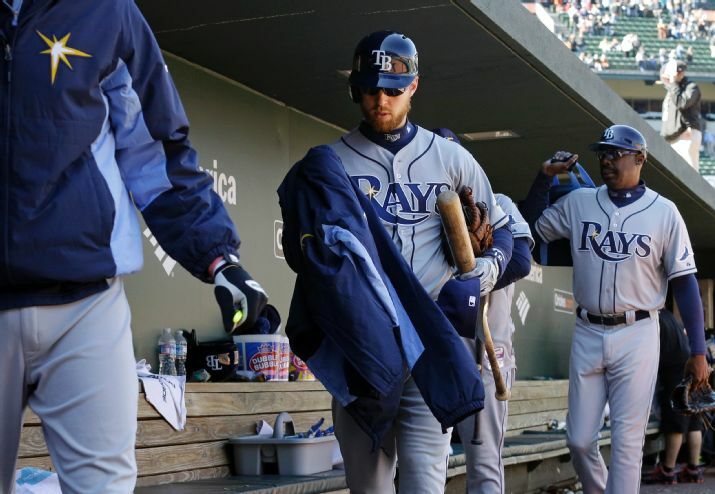 Ian Malinowski of DRaysBay asks if we should be freaking out over the Rays scuffling offense?